This is my variation on limoncello, a sweet and potent lemon liqueur from Italy, which is served cold in small glasses. I call this clemencello after clementine tangerines, but in truth, I use a variety of oranges and tangerines, choosing citrus with the sweetest peels. Many recipes for homemade limoncello call for 100-proof grain alcohol, such as vodka or Everclear. I like Monopolowa, an 80-proof potato vodka; its neutral flavor takes well to infusing and mixing with other flavors. With a Microplane, zest the surface of the tangerines and oranges, being careful to only take off the top layer; if you scrape too hard, you’ll end up with the pith (the white membrane under the peel), which results in a too-bitter brew. 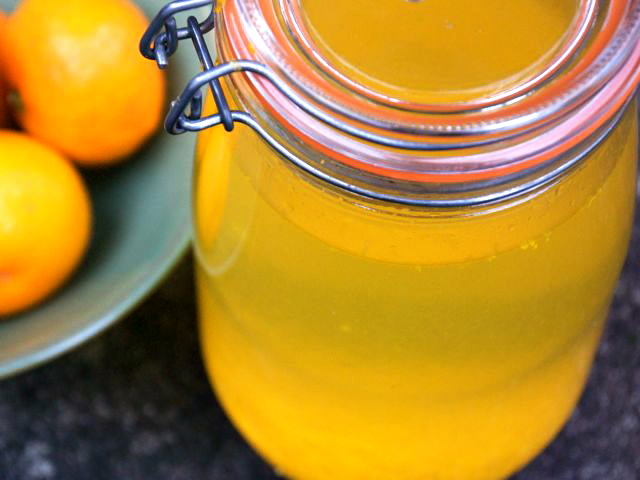 Add the zest to a large clean jar. Pour the vodka over the zest and seal the container. Let sit undisturbed in a cool, dark place for 3 to 4 weeks. Place 2 cups sugar and 2 cups water in a saucepan and bring to a boil. Cook until the sugar has dissolved, then remove the pan from the heat. Let the sugar syrup cool to room temperature. Add half of the cooled syrup to the orange peel-vodka mixture, stir, and taste. If it’s not sweet enough, continue adding more syrup until you like the taste of it. Pour the clemencello through a funnel lined with a coffee filter or cheesecloth into a large spouted pitcher. Divide the clemencello among gift bottles and seal. Store clemencello in the freezer. To serve, pour into small glasses and offer it for dessert with a plate of biscotti and/or chocolate truffles.